Selecting the right wine for a meal can be a pretty difficult task. Often times a great glass of wine can be ruined or made spicy when sipped next to the a meal with competing flavors. This quick guide for how to pair wine with food is a good resource to checkout before your next dinner party so you can be sure to use the right vino while cooking, and serve the best option to your guests. If you already have a favorite wine in mind but aren’t sure what to serve it with, browse our blog to find dozens of simple recipes for any occasion. Sort our posts by category to help narrow your search, and if you still don’t find what you’re looking for shoot us a message on Facebook and we’ll help you find the perfect meal! A crisp glass of Champagne, Prosecco or Sparking Wine is the perfect compliment for mild fish, starches, vegetables (not roasted), as well as soft and hard cheeses. Many associate a glass of Champagne with dessert, and while theres not a bad time for a glass of bubbly, sparking wines reach their fullest potential when paired with something salty. Some of the sweeter wine selections including Riesling and Moscato are a nice compliment to soft and hard cheeses or cured meats which is why sweet wines are often served with appetizers like charcuterie and cheese plates. Sweet white wines are also excellent with spicy foods. White Table Wine, Sauvignon Blanc, and Pinot Grigio pair well with any vegetable regardless of it’s preparation, starches and mild fish. Dry white wine is typically good for cooking as well since you want a wine with very little sugar, you might try cooking with dry white wine when preparing lighter foods like chicken, veal, pork and seafood. Chardonnay and other rich white wines are a good choice with seafood since they go nicely with everything from flakey tilapia to shellfish. In addition to fish you wont be disappointed when you pair a rich white wine with soft cheese, starches, white meat, or any creamy dish. Lighter red wines like Pinor Noir are a really nice choice when indulging in crab, lobster or any other savory seafood. These wines also taste great with cured meat, white meat, starches or roasted veggies – especially mushroom driven dishes. Red Table Wine, Zinfandels and Merlots are great with heavier and full-flavored foods including cured meat, red meat, white meat, starches, hard cheese and roasted vegetables. 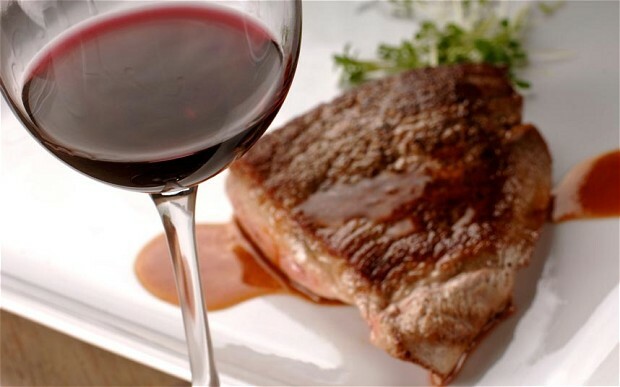 Opt for a medium red with almost any roasted food and you won’t be disappointed. Generally speaking, Cabernet Savignon and Malbec are the best choices for rich, hearty meals like a big steak dinner with loaded mashed potatoes. You can count on a bold red wine to taste great with any red meat, starches, and hard cheeses. Since 1916 Passanante’s Home Food Service has been delivering restaurant quality foods to families across New Jersey, Pennsylvania, Delaware, Maryland, Virginia and North Carolina. If you’re curious to know if our food delivery service is right for you, click here to request a free food sample or call us at 1-800-772-7786 to schedule a consultation! This entry was posted in Food Tips, Recipes and tagged Food Delivery Service, Gourmet Food Delivery Service, how to select wine, Passanante's Home Food Service by Passanante's Home Food Service. Bookmark the permalink. Knowing the basics, together with learning what you like can help to pair up the right wine and food.The five major things to consider when decided what wines to pair with food are Fat, sugar, bitterness, salt and acid.